The Mainstream Media Shrugs At Rand | Dude, Where's My Freedom? Posted on March 8, 2013	by Dude Where's My Freedom? As I’m sure most of you are aware, on Wednesday night, Rand Paul delivered an epic 13-hour filibuster over the Obama administration’s horrifying drone policy. The fact that the President claims the authority to kill whoever he wants, whenever he wants, wherever he wants, so long as he claims they are a terrorist and an imminent threat is a big deal, and should be big news. Long filibusters of this nature are pretty rare, and should be big news in and of themselves. I think it’s safe to say that this act by Rand was easily the biggest news of an otherwise uneventful Wednesday. Surprise surprise, the mainstream media disagrees! As Rand yielded the floor, ending his filibuster to a standing ovation by the Senators present (who were quickly informed by the President of the Senate that “expressions of approval or disapproval are NOT allowed!”), his unprecedented stand for freedom was front-page news on nearly all legitimate news aggregator websites, from the liberal Huffington Post, to the conservative The Blaze, and others such as the Drudge Report, Fox News, etc. It was not a front-page story on ABC, NBC, CBS, or the New York Times. Despite the fact that for most of yesterday, #standwithrand was the #1 trend worldwide on Twitter, the next morning, this rare and significant act was treated as just another ho-hum Washington occurrence. When I logged into Google News, it was third among the “Top Stories” behind North Korean nuclear threats (gee, there’s a shocking new development) and the fact that Obama had dinner with some Republican members of Congress in an attempt to bribe them into voting for his unconstitutional gun-grabs. And what was the story that Google News linked to when it got around to Rand’s filibuster in third place? This disgraceful piece from the Washington Post, which is fairly typical of how the MSM has responded to this incident. As usual, they tried their best to ignore it, but eventually, when forced to respond, instead they mock, denigrate, and insult. Even his “colleagues” in the Senate couldn’t wait to lick Obama’s boots by attacking Rand, giving the MSM more ammunition to write him off as a crazy extremist. 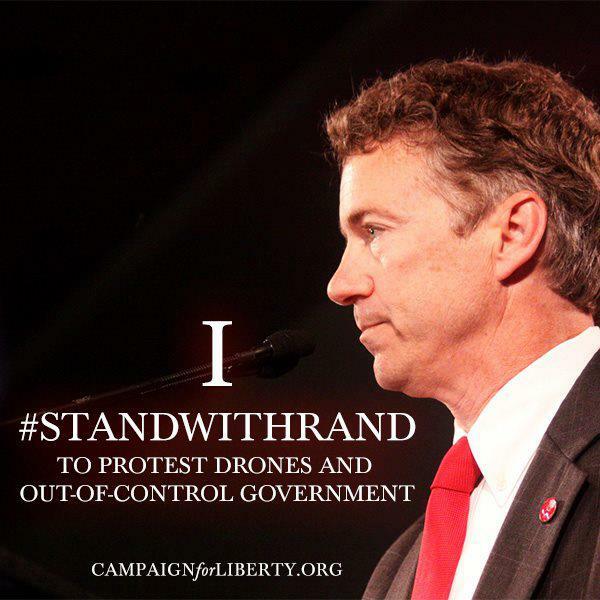 While the jury is still out on whether Rand is a true friend of liberty or just a political opportunist, there is absolutely no doubt that his actions on Wednesday night were positive, both for the liberty movement and for society in general. The fact that we are actually having a debate over whether Obama can kill anyone he wants at any time on his word alone is patently absurd. By ignoring the story and denigrating his achievement, the media is simply proving once again how irrelevant it has become. This entry was posted in News Commentary and tagged Constitution, drones, filibuster, media, media bias, rand paul, senate, twitter. Bookmark the permalink.